For the man who wants 2000 Power Boosts. Cont (RC): During your rurn, if you have 2 or more Units with the Bloom ability, this Unit gains Power+2000 and “Auto (RC) GB1: [Counter Blast 1] When this Unit’s attack hits a Vanguard, you can pay the cost. If you pay it, look at the top 5 cards of your Deck, search for up to 1 Unit with the Bloom ability, show it, add it to your hand, shuffle the Deck.”. Bloom – Auto (RC): [Soul Blast 1] When this Unit or another of your Units with the same name is placed on (RC), you can pay the cost. If you pay it, choose up to 3 Units, during that turn, those Units gains Power+2000 and “Auto (RC) GB1: When this Unit Boosts a Unit with the Bloom ability, during that battle, this Unit gains Power+2000.”. For Today’s Card, we’re introducing 2 cardsd from the Trial Deck “Flower Princess of Abundant Blooming” (on sale December 9th, 2016): The Grade 2 “Sprinkling Water Maiden, Ramona” and the Grade 1 “Light Flower Maiden, Penelope”, both of which support 《Neo Nectar》’s 【Bloom】. “Sprinkling Water Maiden, Ramona”, if you have 2 allies with the Boost ability, her Power jumps to 11000! 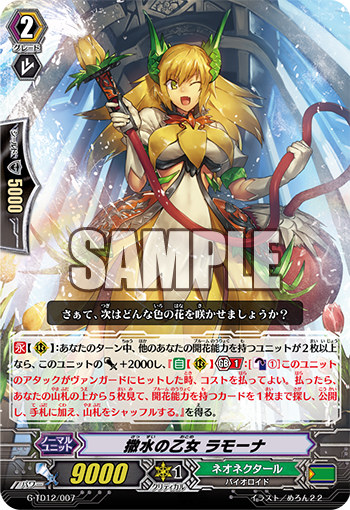 With Vanguards with the Bloom ability, such as “Ranunculus of Searing Heart, Ahsha” or “Summer’s Height Flower Maiden, Marjukka”, it can be pretty easy to activate this effect. And, when its attack hits, you can look at the top 5 cards of your Deck, search for 1 card with the Bloom ability, and add that card to your hand. Because 《Neo Nectar》 cards often have effects related to bringing out and having multiple copies of an ally, “Ramona” is essentially a vital and excellent card. “Light Flower Maiden, Penelope”, once you’ve achieved the conditions of its 【Bloom】, lets you choose 3 of your Rear-guards and grant them 2000 Power, and when this Unit Boosts a Unit with the Bloom ability, its ability grants it Power+2000. It’s Good to aim for a power-up after achieving Generation Break when it Boosts a Unit with the Bloom ability! So call multiple copies of the same Unit early on and attack aggressively. “TRY3 NEXT” which goes on sale the same day, includes many cards that enhance 【Bloom】, so be enjoy watching for further information! And because today the “Weekly Vanguard Column” has been updated, be sure to check it out!